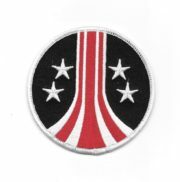 This is a 4 3/4″ x 2″ mint patch which features the logo of the fourth Indiana Jones Movie, “Indiana Jones and the Kingdom of the Crystal Skull”. This is a new, unused, 4 3/4″ x 2″ mint patch which features the logo of the fourth Indiana Jones Movie, “Indiana Jones and the Kingdom of the Crystal Skull”. This patch comes with a glue backing for easy application and has been stored in a smoke and pet free environment.